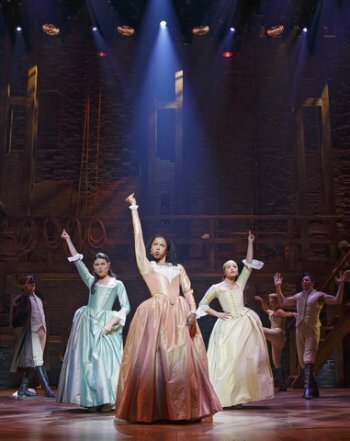 The Broadway transfer of The Public Theater’s acclaimed musical Hamilton has finally taken place and the show looks and sounds even more comfortable on the larger stage of the Richard Rodgers Theatre. Alexander Hamilton may have been the unsung hero among the Founding Fathers of the American Revolution but this new musical has changed all that. Hamilton, now safely ensconced on Broadway, blows the dust off history and turns his story into the most exciting stage show in town. Inspired by Ron Chernow’s biography, triple-threat creator Lin-Manuel Miranda, the composer, librettist and star of the show playing the title role, has had the terrific idea to write Hamilton as a through-composed hip-hop, r & b, rap musical which gives the 200-year-old story a tremendous shot of adrenalin. This may well be the first hip-hop musical to reach Broadway but also pays homage to the styles that preceded it. Director Thomas Kail, who also piloted Miranda’s Tony Award-winning In the Heights, has cast the show with a multiracial company that is made up of some of the best rising stars in the business. Besides Miranda who also appeared in New York City Center Encores!’ Merrily We Roll Along and In the Heights, the cast includes Leslie Odom, Jr. (Smash, Leap of Faith, Rent), Phillipa Soo (Natasha and Pierre and the Comet of 1812), Christopher Jackson (Holler if You Hear Me, After Midnight), Renée Elsie Goldsberry (the musical versions of Love’s Labour Lost and Two Gentlemen of Verona), Okieriete Onaodowan (Rocky, Cyrano de Bergerac) and Jonathan Groff (Spring Awakening, Hair, Glee). It has been a brilliant conception to make the company on stage resemble the diversity of our city just as the revolution of 1776 resembled the make-up of American society in those days. The energy on stage of the Richard Rodgers Theatre could propel a contemporary revolution, and to a great extent is doing just that. Extremely faithful to the Chernow biography even in its telescoped fashion, the text also includes famous lines of the participants as well as slogans from the Revolutionary War period. The densely packed story makes it quite apparent that Hamilton who only lived to be 49 years old before he was shot in the 1804 duel with Burr was a dynamo who was never not working or coming up with new ideas. The varied score also has in-joke quotes from musical theater history from Gilbert & Sullivan to Jason Robert Brown. Each of the main characters is given a song which introduces them (and recurs as their theme song: Hamilton’s “I’m not throwin away my shot,” Angelica’s “I will never be satisfied,” Burr’s “But no one else is in/ The room where it happens,” etc.) so that there is no problem keeping straight the large cast of historical personages. The majority of the 34 songs begins small and then segues into large-scale production numbers dynamically choreographed by Andy Blankenbuehler, another member of the In the Heights team. Each turns into a one-act play in the manner that Stephen Sondheim has made famous. The singing and dancing ensemble of eight (which often grows to ten during crowd scenes) is used as a Greek chorus to both comment as well as participate in the conflicts through their stylized movement. Alex Lacamoire, a long-time Miranda collaborator, is responsible for the electrifying orchestrations and musical direction. The sung-through musical is narrated by Burr (played by Odom, Jr.) who starts as Hamilton’s first American friend and ultimately becomes his last enemy. In the course of the show which travels from Hamilton’s birth to death, we learn of his arrival in New York City as an ambitious, illegitimate orphaned teenager from the West Indies. 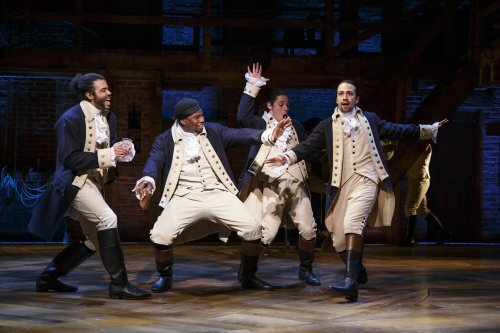 Wanting to attend college and study law, he meets young and ambitious Burr and is introduced to his friends, the patriots Hercules Mulligan (Onaodowan), John Laurens (Anthony Ramos) and Frenchman Marquis de Lafayette (Daveed Diggs). 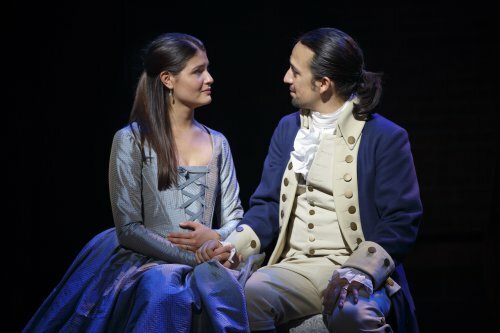 Accepted as a member of General George Washington’s staff because of his brilliant mind, he meets the well-connected trio of Schuyler sisters at a ball and is attracted to two of them, the charismatic Angelica (Goldsberry) and the lovely Elizabeth (Soo) with whom he immediately falls in love and marries. The first act ends with the conclusion of the War for Independence against Britain, the Constitutional Convention, and Hamilton’s appointment to Washington’s first cabinet as Secretary of the Treasury. Hamilton is now at his zenith. The second act begins with Thomas Jefferson’s return to the U.S. after five years abroad as Ambassador to France and his immediate appointment to Washington’s cabinet as the first Secretary of State. He and Hamilton take an instant dislike to each other as they find themselves on opposite sides of all issues and he and James Madison, once Hamilton’s collaborator on The Federalist essays, look for ways in which to bring Hamilton down. Hamilton’s affair with Maria Reynolds gives them the ammunition they need to undermine his reputation. When Hamilton keeps Burr from becoming president by throwing his votes to Jefferson, this causes Burr’s undying enmity. Not trusting Burr who takes whatever side is convenient, Hamilton is reported having spoken disparagingly of him in conversation. The hasty correspondence between Burr and him that follows results in the challenge of the fatal duel. Burr eventually admits that killing Hamilton was a grave mistake. In the finale, we find out about the good works continued by Hamilton’s widow Eliza who outlives him by 50 years. Kail’s dazzling staging is always inventive, with each scene having a new look and a theatrical surprise: one scene is lit by banks of candles while another reveals that there is a revolve in the middle of the stage. The cabinet duels between Hamilton and Jefferson are handled with them on mikes and with Washington as referee, just as they might be today. Staircases are peeled off of the set walls for various sequences while desks or benches magically appear for indoor or outdoor scenes.Although David Korins’ set with its wooden flooring and wooden balconies against brick walls (suggesting a tavern or pubic house) is minimalist, it is the period-perfect costumes by Paul Tazewell that give the show its historic look. Howell Binkley’s lighting also varies from lanterns to street lamps to chandeliers to candles to make the evening an 18th century event. While the cast is uniformly excellent and in tune with both the historical time period and the contemporary ambiance, some of the portrayals stand out as showier than the others. Miranda makes Hamilton a proud, overconfident, driven man who seems to have little knowledge of how he comes across to others. As both narrator and character, Odom is a devious personality who can never be taken for granted. Goldsberry’s Angelica is elegant, sophisticated and quick-witted, just as she is reported to be from history, while Soo as her middle sister Eliza is a warm, lovely presence. Diggs makes Jefferson a comic character, foppish and arrogant, while Christopher Jackson’s General Washington is a somber, upright gentleman. 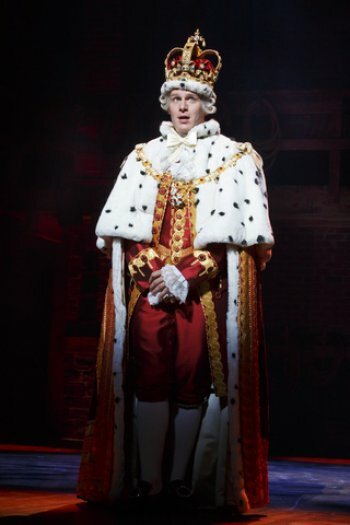 Groff as King George III has three witty and entertaining appearances and the musical numbers to go with them the inimitable style of Gilbert & Sullivan. Onaodowan demonstrates great range as the patriotic Mulligan and the politic Madison, changing his posture to accommodate these two very different men. Lin-Manuel Miranda’s Hamilton does for the American Revolution what Les Miserables does for French 19th century history. However, its contemporary sound turns Hamilton into a theatrical revolution that is just short of titanic. From the expert cast to the impeccable design team to the splendid score and text, Hamilton makes musical theater history. Just a warning: don’t come tired! Hamilton is dense and busy and fast moving and jam-packed with information. You will want all your faculties about you. A first-rate piece of theater that showcases Lithgow’s inestimable skills as an actor and performer, even as it comes to focus on two particular stories.